Writings, art works, inventions and even ideas can be protected now and for the future. Here's a look at protecting intellectual property. Among its many influences on modern culture, the Internet has provided a virtually unfettered outlet for writers, artists, musicians, inventions and ideas. Today more than ever, an individual’s creative contributions can take on lives of their own, generating wealth in ways and from ideas the author or inventor never imagined. Such intellectual property has value under the law and should be included in an estate plan to protect heirs’ rights to preserve those creations and any related financial gains. John Steinbeck’s works provide a case in point. In 2006, a U.S. district judge in New York granted publishing rights for 10 Steinbeck works to son Thomas Steinbeck and granddaughter Blake Smyle, who had cancelled rights to the works held by a publisher and the children of Steinbeck’s third and last wife, Elaine, among others. 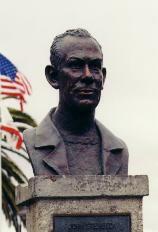 Thomas Steinbeck is the author’s son by his second wife. The granddaughter is the child of the couple’s second son, John Steinbeck IV. The convolution of family relationships – first wife, second wife and children, third wife and step-children – illustrates the need for specific instructions in the estate plan and related documents such as a will for who will receive the rights and responsibilities for the intellectual property. What if, however, the value of the property hasn’t been determined – or possibly even imagined – at the creator’s death? Author Robert E. Howard committed suicide in 1936 at age 30 – 46 years before Arnold Swarzenegger brought Howard’s character Conan the Barbarian to life on screen. Prior to his death, Howard’s works had only been published in Weird Tales and similar pulp fiction magazines. Paperbacks didn’t appear until the 1960s, followed by comic books in the ‘70s and the film in 1982. Howard’s father, his only surviving relative, could not have foreseen the popularity the works would garner in the decades following his son’s death. Intellectual property, defined by law as expressions of ideas and knowledge, falls into two categories: works protected by copyright, such as writings, music and visual art, and those protected by patents, including processes, machines, designs for manufactured items, software and internet applications and food products. Copyright protection begins at the moment of creation, with no action needed by the creator, and lasts 70 to 120 years, depending on the date of creation. Patent protection requires an application and approval from the U.S. Patent & Trademark Office and lasts 14 or 20 years from the date of application, depending on the type of patent. Both types of protection can be transferred during the creator’s lifetime or at death by a will or probate. Patent owners may transfer the ownership of the patent or grant licensing rights through a written document. Copyright transfers require a written document for exclusive rights but not for nonexclusive rights. Additionally, special copyright rules apply for works created under a contractor employment of another party, with ownership of the copyright usually residing with the creator unless otherwise specified in writing. If the creator sells the work itself, he usually retains the rights to the idea itself. If that sounds complicated, you’re right. That’s why legal and estate professionals often recommend that individuals who anticipate bequeathing intellectual property rights name a qualified expert in the area (music, art, writing, etc.) to manage those issues. An entrepreneur whose intellectual property may be tied to his business should seek tax advice on transferring those rights to his heirs. Determining the value of these assets can be difficult, so professional help will be needed in that area as well. Individuals often think only of tangible assets – real estate, securities and other personal property – in creating a financial plan. Those whose work touches on copyright or patent issues should include detailed plans for those assets as well. Previous articleWhat is a Good Credit Score? Gift Cards: the perfect gift?